Since I am working my way through Mom Blog to Money Blog, I have decided to revive Blogger Appreciation Day but it will be a bit different. While I will be telling you where my hits to website traffic is coming from, I will not be providing the linky. This is a thank you post to those that send me traffic hits to website! Thanks a million to my TOP Five blog referrals! I received referral visits from 324 sources during last month! Want to find out where others are getting their hits to website? Crystal and Company shares how she is getting traffic each month, too! Southern Mom Cooks talks about how she is getting more traffic to that site so quickly! You can also go here for past hits to website traffic referrals on this site all list their top traffic referrals for the previous month! If you want to play along, please leave a direct link to your top five referrals post in the comments section. Go into your tracking service (I use Google Analytics) and set the time period for the previous 30 days. 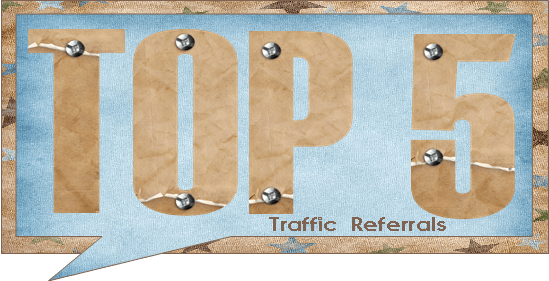 Write a post (like this one) listing your top 5 referrers. Thanks for this information because we are looking for ways to market our blog but are still beginners. Good list of blogs that sent you traffic! I have to check on my top referrers. I have no idea who they are. I need to get involved in more linkys etc to get referrals from other sites I guess. It is interesting to me to see some of the same sites sent you views to both of your blogs while some of the sites listed are new. I guess it just depends on the site and their audience.